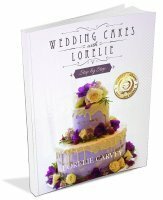 Use these fondant cake decorating charts to estimate how much sugarpaste you will need for your next wedding cake or cake decorating project. 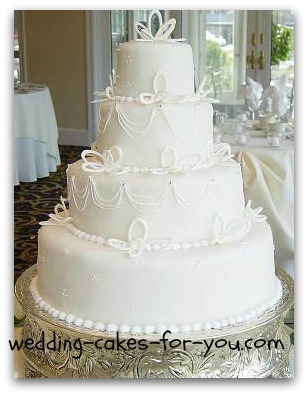 Also on this page you will see a video on how to cover a cake with fondant. 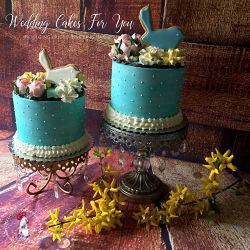 Welcome to Wedding Cakes For You a place for all who love to bake and decorate!!! I hope you find what you are looking for here. The video tutorial is just below. 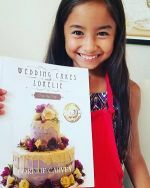 If you have any questions regarding using fondant please see this page where you will find the top Q&A. 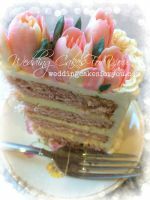 The amounts in the chart are based on a two layer cake with filling. 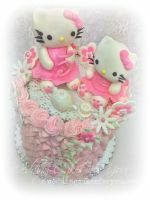 Are you looking for a great fondant icing recipe, there are a few delicious ones on this website for you. 6 inch 1 1/2 lbs. 10 inch 2 1/2 lbs. 16 inch 6 1/2 lbs. Purchase a large 70 lb bucket of Satin Ice or another great tasting fondant and have it on hand at all times. This saves you a lot of time and energy and can be used immediately. In a pinch, or for small projects, make a batch of fondant using marshmallow and confectioner's sugar (which you can stock easily. 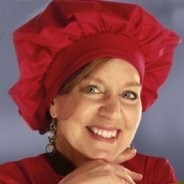 Caution: There is a LOT of kneading involved and it is a great arm workout but if you have any neck or shoulder issues you may want to consider purchasing it ready made as well. You will find a link to Satin Ice Fondant (my favorite) on the supplies page.